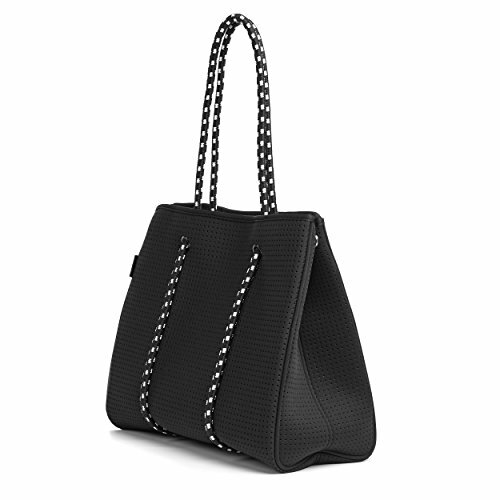 Our gorgeous Black Luna Tote is made from the thickest, highest quality neoprene material. Whether you are off to the office or library to study the durable rope handles weaved through reinforced eyelets can take the weight of laptops and books. Also an ideal bag for heading to the gym or the beach this bag is versatile for all occasions. Excellent for travel with its lightweight water resistant material or as diaper bag for mums who are looking for a stylish alternative to the norm that can fit in all your baby essentials and can be easily cleaned. The Luna spacious tote measures at L: 14.5" H: 11.5" W:6" Includes a removable base board which ensures the sleek structured form of the bag remains. Once the board is removed the bag can be folded and easily stored. High quality metal studs are used to secure items within. Contains one large side zip pocket and two open pockets on the opposite side which are perfect for a drinks bottle, phone and everyday essentials. HIGH QUALITY NEOPRENE TOTE which holds a sturdy shape due to its thickest neoprene material and double rope piping to support form. Uses reinforced metal eyelets to prevent ripping on rope handles. SLEEK STRUCTURED FORM is achieved with the removable base board. When the base is removed the bag can be easily flattened and stored. LINED INTERIOR which includes a secure zipped pocket and an open pocket which is the perfect size for storing a drinks bottle. High quality magnetic studs ensure the bag is securely closed. MULTI PURPOSE & FASHIONABLE tote which is perfect for everyday use to the office, beach, gym or use as a diaper bag. This spacious tote measures at L: 14.5" H: 11.5" W:6"and can easily carry a lap top and still have space for a girls essentials! MACHINE WASHABLE AND DURABLE. Easy to clean water resistant neoprene material. If you have any questions about this product by Luna Bags, contact us by completing and submitting the form below. If you are looking for a specif part number, please include it with your message.